Travel with confidence knowing that all NAPA brand parts purchased here are backed by the NAPA National Warranty Program honored by over 6,000 NAPA stores across America. For information about our services and their benefits to you, stop by the store. 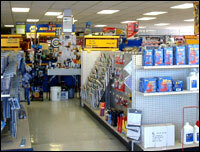 Get the Napa part you need at Napa Online. Get the filter you need at Napa Filters. Get the brakes you need at Napa Brakes.